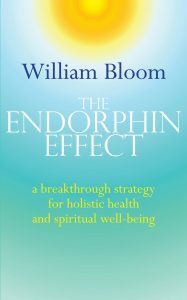 The Endorphin Effect is a set of easy-to-use strategies that support holistic health and development. Endorphins are natural chemicals produced by the body. They are part of the family of chemicals known as hormones and neuropeptides. They are produced in every cell of the body and are involved in the relaxation of tissue, the anaesthetizing of pain and the physical sensations of pleasure. All zoological creatures, including the single-celled, produce endorphins. A well-balanced state of health includes an ongoing production of endorphins. Babies, toddlers and children are naturally â€“ given a non-violent family and culture â€“ endorphinated. As adolescents and adults we tend to lose our natural wellbeing and tighten up. Adrenalin and cortisol â€“ the hormones of tension and anxiety â€“ begin to predominate. The Endorphin Effect identifies five strategies that trigger the production of hormones: â€¢ Rest â€¢ Exercise â€¢ Positive Triggers â€¢ Attitude of Inner Smile â€¢ Connection with Natural World. It also clarifies the techniques for using and deepening the effect of those strategies whenever someone chooses to, even when exhausted or ill. These strategies were clarified in the 1990â€™s by Dr William Bloom, a psychologist and meditator. He became aware of the scientific discovery of endorphins and integrated their function into his personal experience of meditation and teaching meditation. His bookÂ The Endorphin EffectÂ was first published in 2001. The strategies have been integrated into the therapeutic work of many healthcare practitioners. This began with many of the therapy team in Bristol Cancer Help Centre (now Penny Brohn Centre) using the approach. In the Spring of 2006 a six week experimentation programme took place at Westminster University to examine whether the Endorphin Effect strategies â€“ called â€œkinesthetic meditationâ€™ in this context – had any effect on cortisol levels. The Endorphin Effect is a profound yet universal and easily applied process for enhancing oneâ€™s joy and fulfilment in life. Itâ€™s good for your health at all levels. This fascinating approach reveals another dimension in healing ourselves, triggered by our own initiative. Intriguing and compelling. I found the endorphin training to be very useful both from a personal and work perspective. The strategies are straightforward and easy to apply and I’m looking forward to incorporating them in my own training. A very worthwhile exercise. Endorphin Effect, what can I say!! Made a lot of sense re Hell state/Bliss state and would be confident delivering this.Â Learning about the release of endorphins and how we can access this power.Â Exercises excellent way of demonstrating release of endorphins.Â Power-Naps are the way of the future!! I thought the Endorphin Effect training was excellent! With the backing of scientific evidence it should persuade even the “non-believers” to try it. Personally I feel it is a very useful self management system. In fast pace society full of increasing demands the Endorphin Effect techniques help combat the mounting stresses. The Endorphin Effect is simple and effective and having used it myself I believe they help. When my wife was going for a job interview I had her use the several of the strategies and she felt that it helped her to relax before the interview (she got the job!). Apart from Stress Management, strategies from the Endorphin Effect could be used in various training events for example, managing change, managing difficult situations, customer services skills. Really good with some useful tips for personal & work place strategies. The course was a mixture of chilling out refocusing and revitalising. I see great scope for utilisation at a personal and business level and given the change in the organisation that is coming down the pipeline, will be a tool to be marketed and taught in a range of different courses. I found this course really good, I have not been involved in anything like this before and was amazed at the effect the relaxation and exercise sessions really do make to how you are feeling and used in the right context and at the right time they could be very useful in the process of training.Â I am delighted that you gave me the opportunity to attend this course. Thanks. Loved the Bliss/Hell State and the science behind it. PNI* is great. I am using triggers & pause and reflect techniques and they work for me. The courses made such a lot of sense- I feel enlightened. * PNI = Psychoneuroimmunology, the scientific term for mind-body healthcare strategies. I thoroughly enjoyed the 3 days endorphin training with Dr William Bloom as it was well explained, relaxed and informative. I have used the skills and concepts learned in every day life ie: at home, at work and socially. I feel that all staff would benefit from this training as it would help them both personally and professionally. Thanks. I enjoyed the course and learnt some very useful strategies in particular the exercises were very useful and I have started to do them most days. Although I already applied the positive triggers/strawberry strategy it was good to have a name put to it as this has helped me explain it to others. I am in the process of reading Williams book and picking up little tip bits as I go along which I will used personally and consider adding to my courses were appropriate.